Thanks to a Superuser question i asked a few weeks ago i discovered the wonderful iReader plugin for Google Chrome. 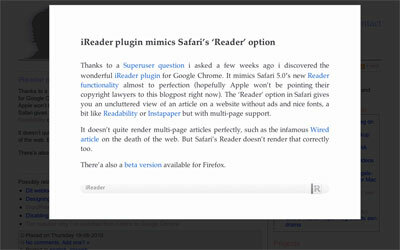 It mimics Safari 5.0’s new Reader functionality almost to perfection (hopefully Apple won’t be pointing their copyright lawyers to this blogpost right now). The ‘Reader’ option in Safari gives you an uncluttered view of an article on a website without ads and nice fonts, a bit like Readability or Instapaper but with multi-page support. It doesn’t quite render multi-page articles perfectly, such as the infamous Wired article on the death of the web. But Safari’s Reader doesn’t render that correctly too. There’a also a beta version available for Firefox.